Vehicle exhausts are responsible for only a third of traffic pollution, according to new research. The study, published in Atmospheric Environment, says nearly half of air pollution from road traffic is down to non-exhaust sources such as brake wear, road surface wear, and particles whipped up from the road by passing vehicles. Professor Ranjeet Sokhi, of the University of Hertfordshire, who led the study, is calling for greater control of non-exhaust pollution. 'In terms of mass, non-exhaust sources can be more important than exhaust fumes, but legislative control has focussed on exhaust emissions,' he says. 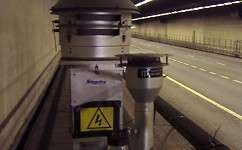 The team took air samples from the Hatfield Tunnel on the A1 (M) in Hertfordshire. They were interested in airborne pollution particles less than 10 millionths of a metre across. 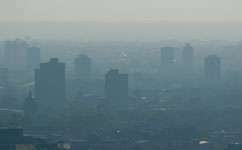 Pollution particles of that size, known as PM10, are linked with long-term health problems, including heart disease. Back in the lab, samples were separated out into their chemical components. By analysing these, scientists were able to calculate where up to 82% of the pollution in the samples had come from. Petrol and diesel exhausts are responsible for only 33 per cent of the particles. 27 per cent are whipped up from the road by vehicles, while brake and road surface wear account for 11 per cent each. Road traffic is thought to be the most important source of air pollution in the UK. As well as the health effects, poor air quality is estimated to cost the UK economy up to £16 billion every year. Parts of London regularly struggle to meet EU air-quality standards. In 2010, Transport for London began spraying a calcite glue solution onto roads, in an attempt to stick pollution to the road surface. Launching the programme, Mayor Boris Johnson said it was 'a wonderful contraption that tackles air quality head on.' But a recent study by scientists at King's College London has questioned the effectiveness of the scheme. 'It is important to recognise that controlling non-exhaust emissions is more difficult; a number of different approaches might be needed,' says Sokhi.